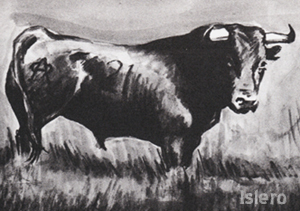 Islero was a Miura bull known for having killed famed bullfighter Manolete on August 28, 1947. 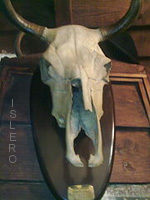 Islero was brought up on the ranch of Eduardo Miura. 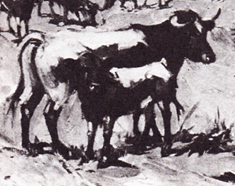 The breed was started in 1848 by Juan Miura, the bulk of the bulls were from the Alvareda ranch. 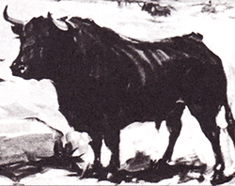 Bulls from the Miura ranch, located near Seville, Spain, are known for being large and ferocious. Islero's father was named "Formalita". and she charged the horsemen when they came to take her calf in for marking. The calf "Islero", young he was, was hard to handle and tried to charge the horses. Like all toros bravos, Islero wanted to fight by instinct and years of breeding, not because of any training or goading. Islero had poor eyesight and tended to chop with his right horn...Remember This. and on his flank with the famous ornamental 'A' design. at a bullfight in the town of Linares in the province of Jaén, Andalusia, Spain. because of Manoletes poor showing during the first fight.The bull's manager begged Manolete to finish him off quickly. and was suddenly gored in the groin by Islero's right horn. Islero thrust his right horn, gorging Manolete in the groin, severing his femoral artery. The matador began to bleed. taking him instead to the courtyard where the horses were kept. The bullfighter arrived at the infirmary seven minutes after being gored by Islero. rupturing the saphenous artery and piercing the muscle nerve tissue of the femoral artery." As he smoked a cigarette, the bullfighter commented that he could not feel his leg. At 11:00 p.m. that evening, he was transferred to the hospital in Linares. "My mother will not be happy about this." Much information is available on Manolete. if not more so, especially to those of us who despise Bullfighting and all animal cruelty. I have presented here excerpts from several sources. Whether they are true or not, I cannot say, but I will always admire Islero and his beautiful, brave spirit. One of my Sources: "The Death of Manolete"
Islero's Fan Club ended it's activity in August 2003. These pages are kept online for the interest shown by many friends and the valuable anti bullfighting information it contains. Thank you to Paco and Islero's Fan Club For Permission to Save This Site. And to Todd, for helping me with the translation. with "Islero" in the subject line. I only speak English, but I will put the email through Google's Translator and get back to you. con "Islero" en la casilla de asunto. Sólo hablo Inglés, pero pasaré su e-mail a través del traductor de Google y me pondré en contacto con usted. ¿Quiénes eran Islero y Manolete? because of the stupidity, greed and cruelty of mankind. Islero's Fan Club is no more. I have been allowed to save it here in memory of Islero.